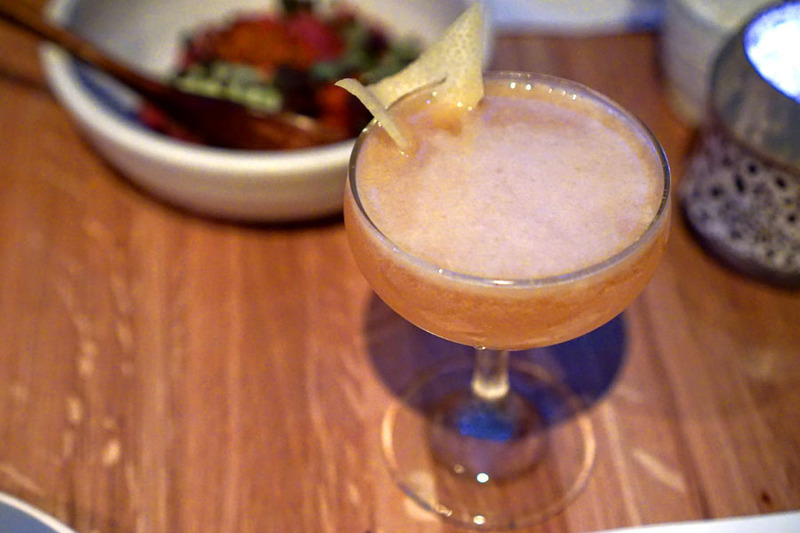 Opened on December 12th, Blackship has certainly been one of the buzzier WeHo debuts of the past year. The restaurant is part of Culinary Lab, the group responsible for the likes of Hinoki & the Bird and Rosaliné, as well as Pizzeria Ortica in Costa Mesa, Hollywood's Lost Property, and sports bar 33 Taps. Running the kitchen here is Chef Keiichi Kurobe, formerly of Hinoki, and his goal is to blend Italian and Japanese cuisines in a progressive manner. In fact, the restaurant's name is derived from kurofune ("black ship"), a term for Western ships arriving in Japan for the purposes of trade, which later led to the incorporation of Western ingredients and techniques in Japanese cuisine. About the Chef: Keiichiro Kurobe was born in July 1985 in the United States, though he moved to Yokohama as a child, and attended Tokyo's Nishimachi International School. He returned Stateside in his teens, and from 2001 to 2004, went to New York's now-shuttered Park West, a high school built in 1978 that was actually known for its culinary arts program. He got his first real restaurant job at the start of 2002, working as a garde manger at BiCE, an Italian joint in the Shiodome area of Tokyo. Kurobe secured a position at San Francisco's Campton Place in March 2004, where he toiled under Daniel Humm and developed his passion for pasta. In July 2006, he transitioned to Hiro Sone's Ame at The St. Regis, and worked the line there until the end of the following year. At the start of 2008, he went to Carme Ruscalleda's Sant Pau in Tokyo and served as a line cook and bread baker for two years. Kurobe's next move came in January 2010 when he became executive sous chef at Luce at The InterContinental San Francisco, where he met mentor Dominique Crenn. In July 2014, he secured his first Executive Chef position when he took over the kitchen at Chanson Restaurant at the Royal Blues Hotel in Deerfield Beach, Florida. That gig lasted under a year, and he subsequently relocated to Los Angeles to serve as exec sous for Brandon Kida at Hinoki & the Bird. 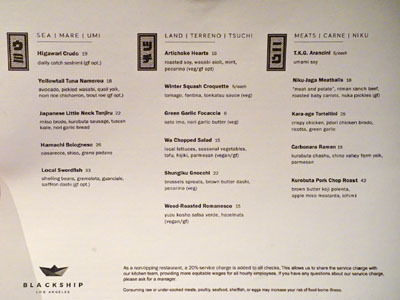 Kurobe left the Century City eatery last year to start work on Blackship. Located next to LA's first Shake Shack, the Knibb Design-penned restaurant features a well-vegetated patio area out front, which then leads to a cozy dining room and bar in the back; total capacity is around 100. Curiously, in the early 1970s the building was known as The Doors Workshop, and was where the band recorded L.A. Woman. Sometime later, it was home to Benvenuto Cafe (1992-2008), Mexico Restaurante y Barra (2009-2010), Tradition Tapas Kitchen/Forbidden Bar & Lounge (2011-2013), and L'Scorpion West (2013-2014). 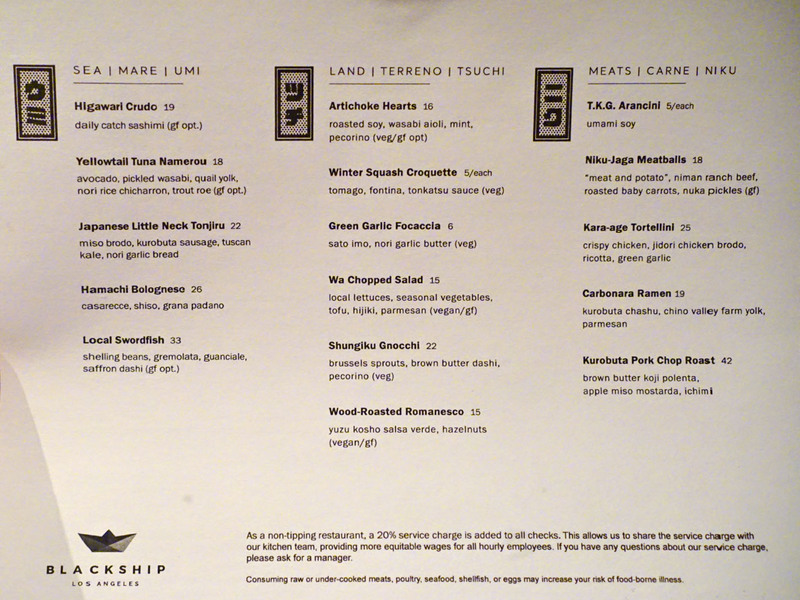 Blackship's menu is pleasingly compact, divvied up simply into sections for sea/land/meat. 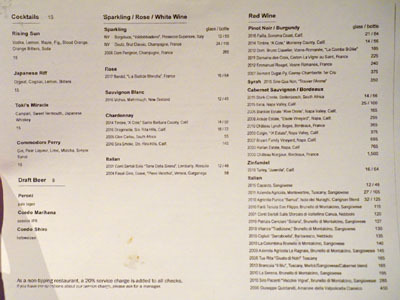 To drink, you get a relatively brief wine list along with a smattering of beers and a mere four cocktails. Click for larger versions. As the name indicates, our first cocktail was a riff on what I believe was the classic sidecar. I found it quite citrusy and somewhat astringent, with the fruitiness of the orgeat coming in toward the back end. 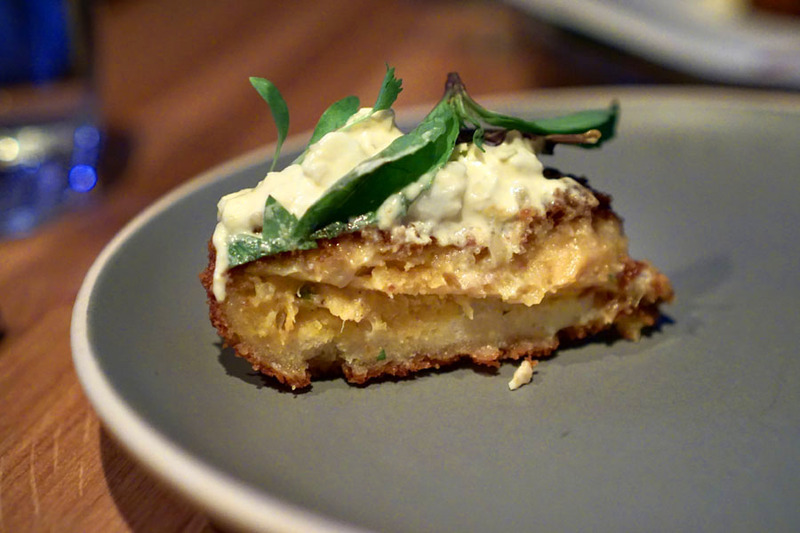 This schmancy looking fritter made for a solid start to the meal. I was afraid it'd be overly sweet, but it wasn't, instead showing off a base of spicy, autumnal flavors augmented by the bite of that sosu while the greenery on top worked to lift the dish. Superb contrast in textures here, too. Our next cocktail was on the refreshing, effervescent side, with subdued fruity and bitter notes. What I found interesting here was the drink's almost savory character, probably from the maple I'm guessing. 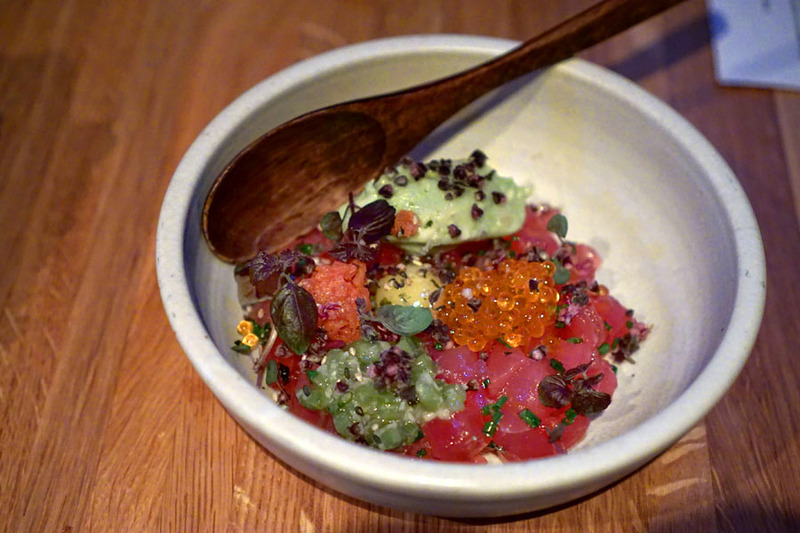 This tartare-like dish of namero featured umami-packed cubes of tuna married to the stinging heat of wasabi, all while the trout roe contributed pops of salinity and textural contrast. Avocado, meanwhile, moderated the interaction. 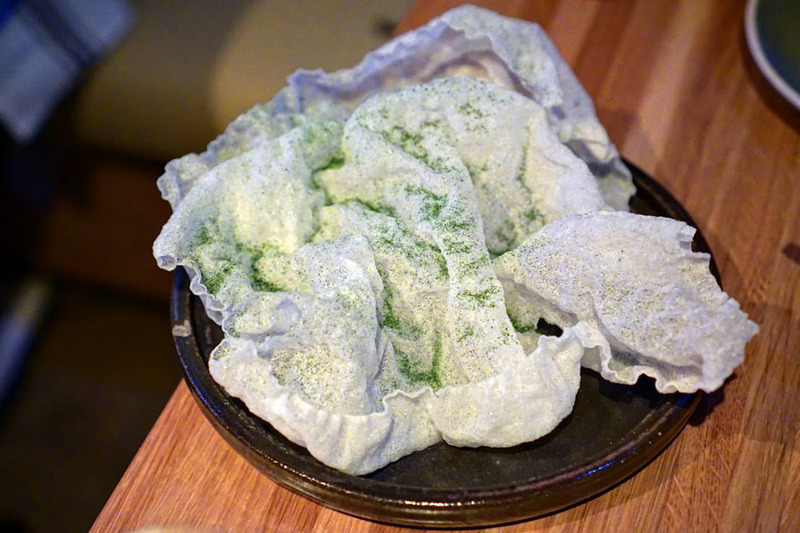 As for that chicharrón, I found it almost impossibly light and fragile, the seaweed powder adding an unexpected depth. Here was the Chef's take on traditional nikujaga stew. 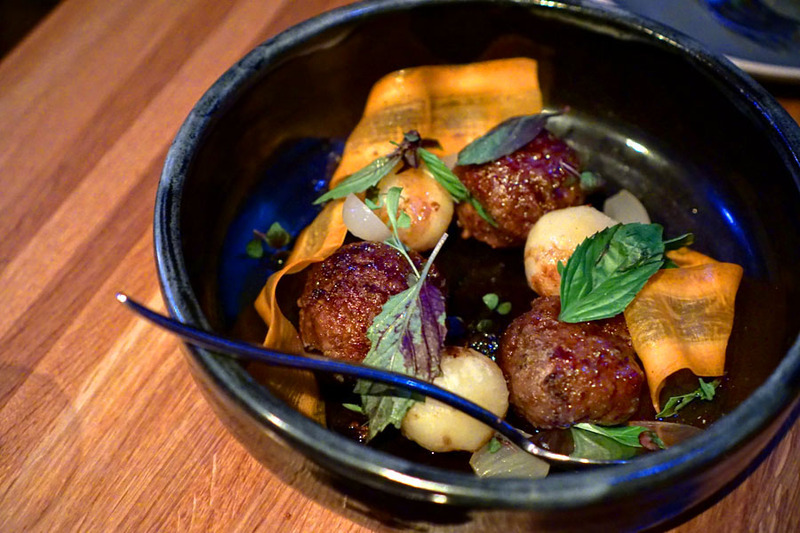 The meatballs were hefty, and had this savory-sweet flavor profile going on that worked with the herbaceousness of Thai basil. Also key were the potatoes, which veered buttery, and I didn't mind the crunch and acidity from the nukazuke pickles, either. The most surprising thing here was that I swear I detected a little bit of mala-esque numbing in the dish. 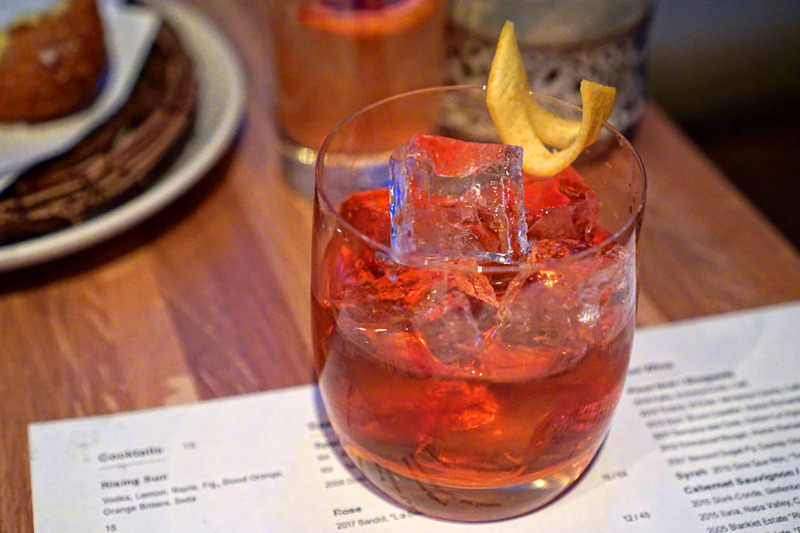 This reworked Negroni showed off the unmistakable bittersweetness of Campari for sure, and despite the substitution of Toki for gin, actually tasted really quite similar to the classic cocktail, but with perhaps a touch more booziness and weight. 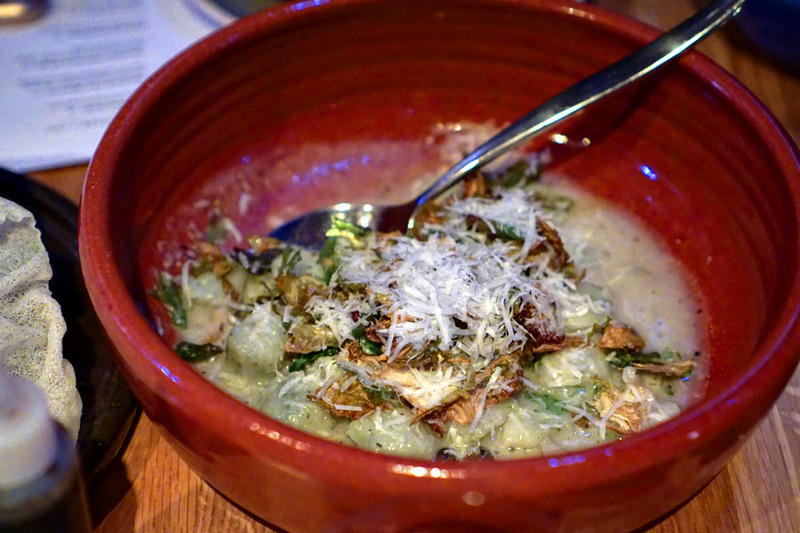 Texturally, the gnocchi were quite nice, coming out properly supple, and substantial but never heavy. 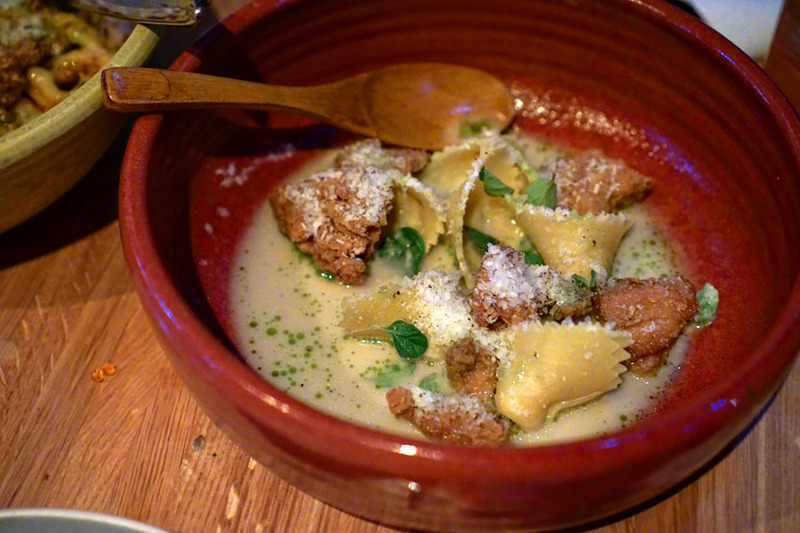 The dumplings made sense with that brown butter-enriched dashi, as well as the additional oomph from the pecorino. Unfortunately, the char and bitterness from the Brussels were too strong for my liking, and tended to dominate the dish. Here we had a thoroughly reimagined version of tamago kake gohan, a dish of rice topped with raw egg. 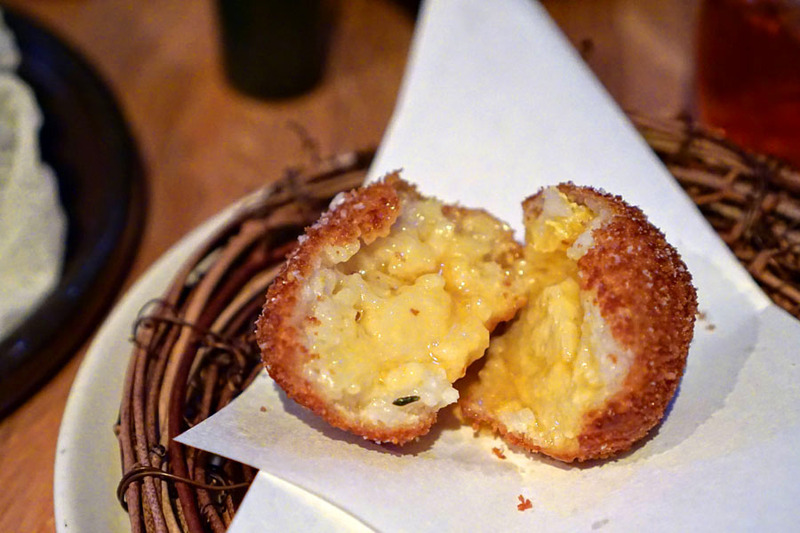 I really enjoyed the crispness of the arancino, as well as the texture of the rice, while the egg imparted a much-needed lushness to the fold. However, there was this pervasive bitterness that was unexpected, and somewhat off-putting. 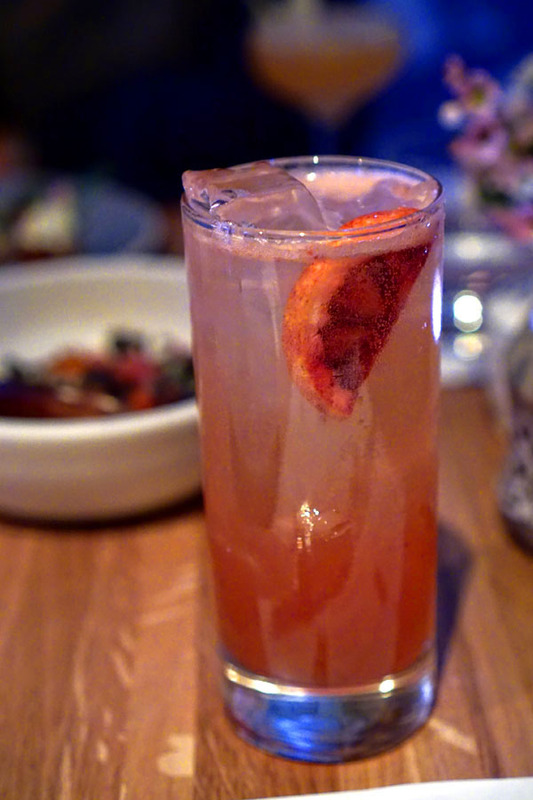 This cocktail was named after Commodore Matthew C. Perry, who was in command of the kurofune that opened up Japan for trade in the 1850s; in addition, "perry" also refers to pear cider. 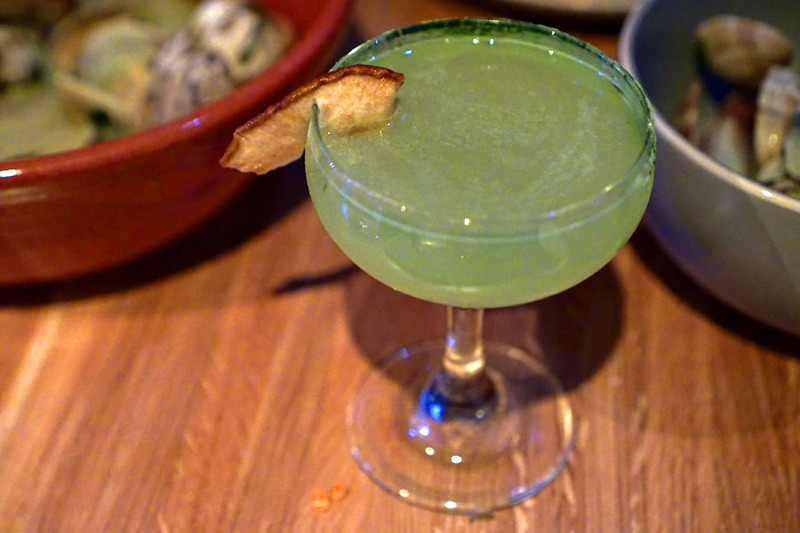 In any case, the drink conveyed a nose rife with green tea, lime, and pear, while the taste brought more of that pear to the forefront, along with a good amount of citrus, all while the back end was all about the botanicals of the gin. 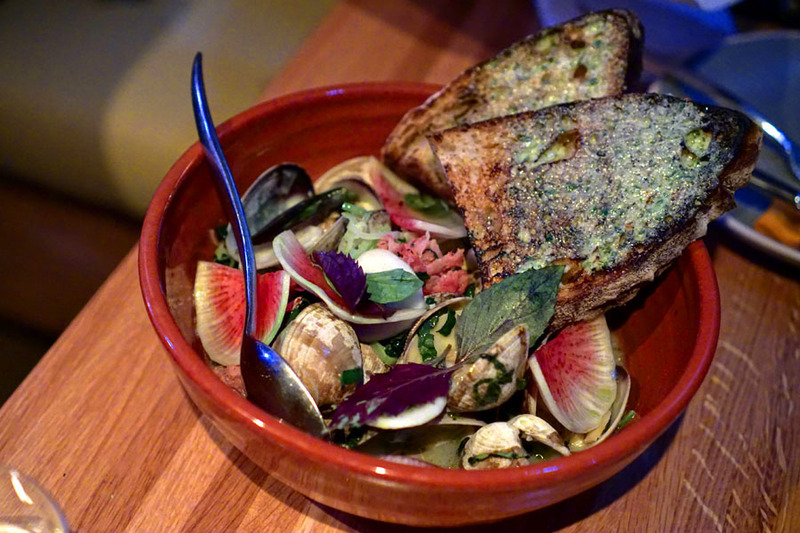 Clams were pretty much spot on, arriving juicy and plump and saline, a smart pairing with the savory-salty nature of the sausage. Thai basil made another appearance here, and once again worked to brighten and lighten the dish. As for that toasty, garlicky bread, it was a treat as well (especially when soaked in that tonjiru broth), and we even took some home. 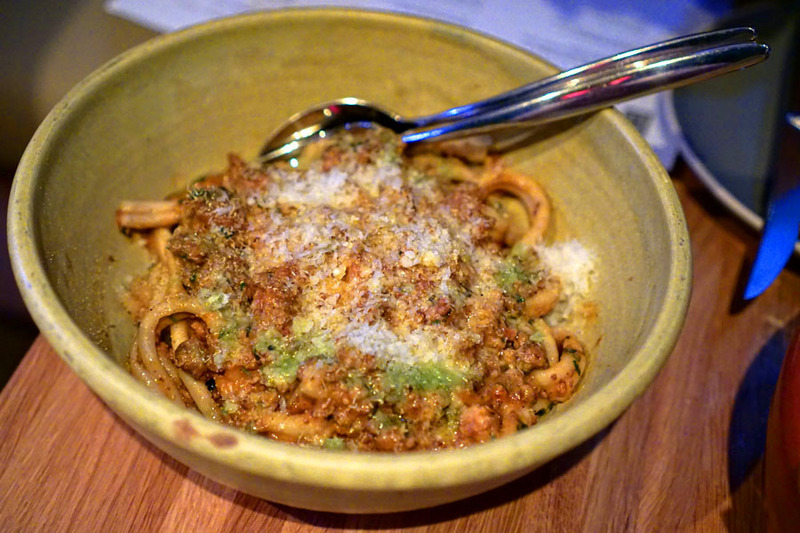 Bolognese was given the Japanese treatment here, and the result was a version of the meat sauce that was thoroughly imbued with the oceany flavors of yellowtail. 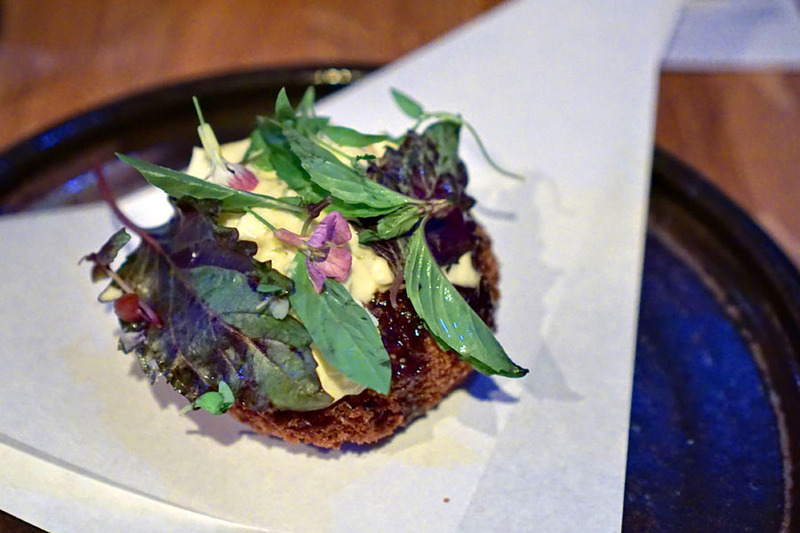 It was much more intense than any classic version of Bolognese I've had before, so the shiso was absolutely crucial. As for the pasta itself, it definitely had a gratifying bite, and functioned effectively as a base to the dish. 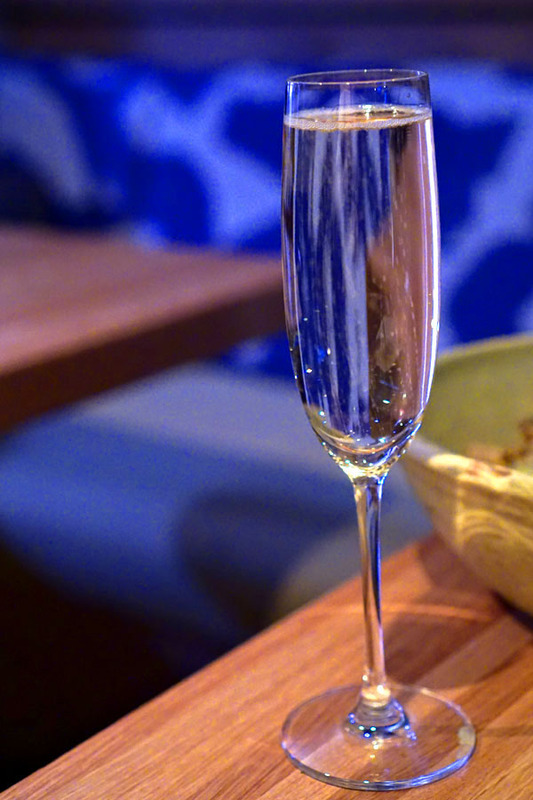 With all four cocktails sampled, we went for a glass of the NV Deutz, Brut Classic, Champagne, France [$24]. As the name states, this was a classic presentation of Champagne. I got appealing aromas of brioche and green apple, while flavors were again toasty, citrusy, with a mixture of sweetness and booze hiding underneath. Tortellini were unfortunately on the tough side, and I didn't get too much from their ricotta filling either. The karaage, meanwhile, were well-textured, though slightly underseasoned. The combination of the two elements didn't quite work for me, though the earthy brodo did help things coalesce, and I was a big fan of that green garlic. The budino was pretty much as good as any I've had thanks to its rich, heady flavors of caramel and dark fruit that were perfectly matched by the toasty hazelnuts. A great ending. 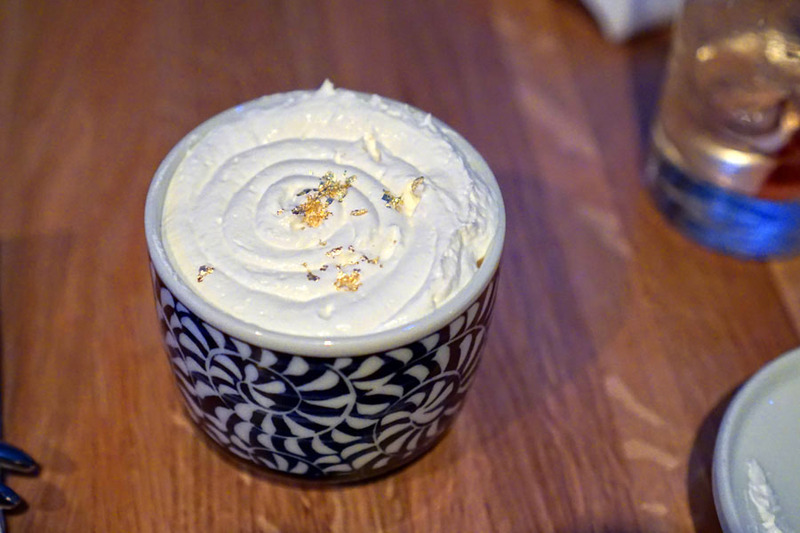 Kurobe is fusing Italian and Japanese cooking in a way that I'm not sure I've seen before. The former cuisine tends to be heartier, more robust while the latter is oft known for its subtlety and finesse, so I think it can be tricky to meld the two. From what we ate tonight, it's clear that some mash-ups work better than others, which isn't surprising. I don't think the restaurant has quite hit its stride completely yet, but things are looking promising. Holy crap, Kevin didn't bring his own alcohol! I will smoke a bowl to that. 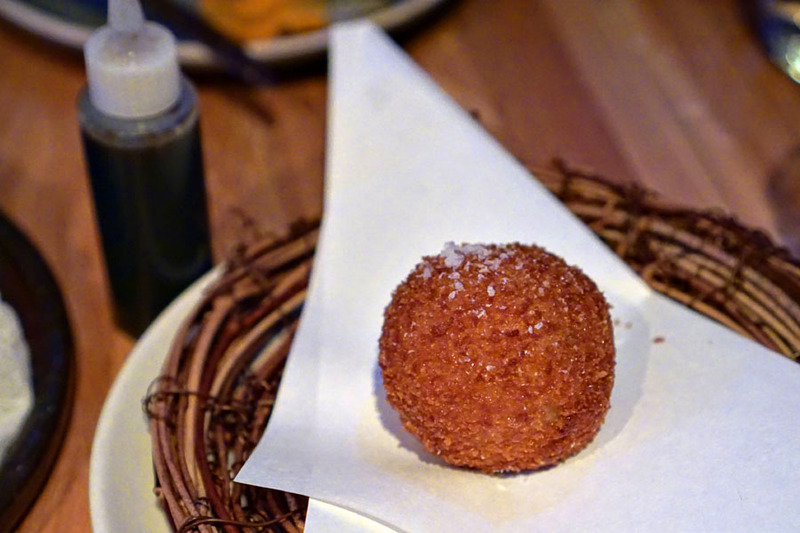 You went to a restaurant named Blackship and didn't include any pirate puns into your review? Arrrrggghhh!! 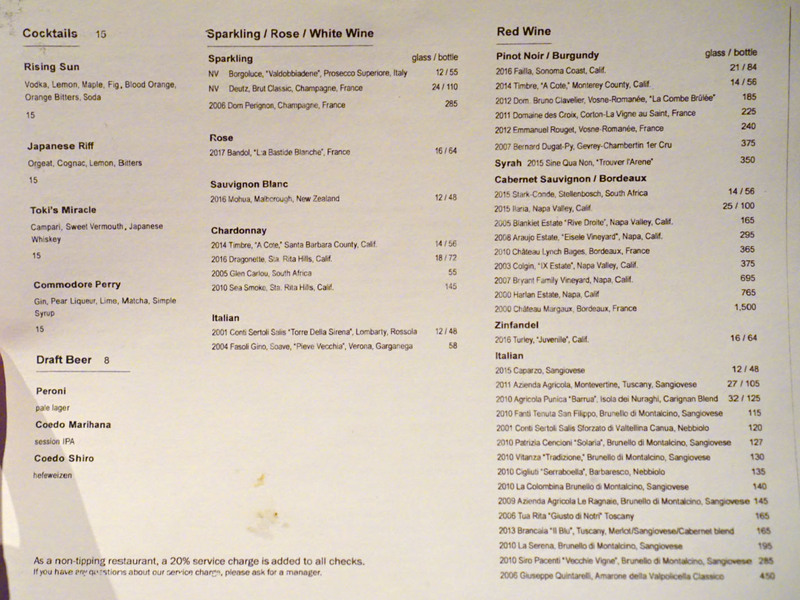 WTF... $24 for a glass of a $30+ bottle of bubbles, we're you able to walk the next morning?